For the last three years I’ve written a What We’re Reading post once a month for Hazel & Wren. I’ve become a better critic in that time, but I’ve always tried to treat each book fairly and objectively, to the best of my abilities. However, reading is a hugely subjective activity and in my reviews I hope to communicate why I, personally, like or dislike a book. I attempt to take each book on its own terms and explore how the author succeeds or doesn’t. All of that being said, I don’t read in a vacuum, and I know that my opinions of a work can be and have been colored by the opinions and actions of those around me, and the world at large; I can’t change that fact. 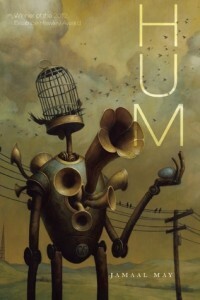 This month, I finished reading Jamaal May’s excellent Hum (Alice James Books, 2013) on Saturday, August 9th, and then checked Twitter, where I saw news of the shooting of Michael Brown. Brown, an unarmed black teenager was shot by a white police officer, and that evening protests roiled the suburb of St. Louis. I began to reread May’s poems, but now with a steady stream of disturbing news from Ferguson, Missouri and elsewhere changing the way I experienced these poems. May’s skill is in directing the reader’s attention, often just away from the main action. He doesn’t ask us to look at the force used to pin him to a vehicle, he asks us to “marvel” at juxtaposed materials: the soft silk, skin, and feathers against the metal of handcuffs, gun, baton, vehicle. By directing the reader’s attention to details or just to the side, a poem’s main subject is thrown into sharp relief. May’s images and metaphors stay fresh long after the poem has ended, often becoming more complex upon subsequent readings. In this way, May is able to make his lived experience political. The poem “Pomegranate Means Grenade” is addressed to 11-year-old Jontae, who is quoted as an epigram to the poem. a kind of gentleness, Jabari? Until Jabari’s name is invoked as the last word in this thirty-line piece, the reader never quite certain the I in the poem is the poet. “Didn’t a poet say cracks are how light gets in everything? / I’m probably mixing that up” May writes in “Thinking Like a Split Melon” and seems to be talking about cracking poetry to let in reality, or vise versa. with whatever stick I happen to find. It’s comforting to me, as a critic, that May is willing to blur the line between his poet self and his persona, especially as the reality of the continuing events in Ferguson bled into my reading of his poems. Cracks let the light in, and May’s poems are filled with plenty of light. It’s bright, and it can be blinding, but his gentle hands help us look just away from the light, at the orb of blood, ripe, but not yet fallen. In this way, the reader is able to see more clearly the violence of living. I hesitate to make an argument that poetry can save or even change the world. In many ways poetry saved my own (very) small world, but poems are fragile things and few of them stand up to the test of time or the burdens of politics. Nazim Hikmet was jailed and exiled simply because soldiers were reading his poems; Seamus Heaney was a steady voice of reason during the Troubles in Ireland. But many political poems are shrill, flat, or dated. The trick—and May knows this as well as Hikmet and Heaney did—is to focus on humanity, not politics. I hesitate to say that Poetry can Save The World—but it can help ease the pain of living. So I want to know what poets ease your pain. What poets do you turn to when the news of the world is too much? What poets offer comfort when it’s needed? What poems do you keep in your wallet or on your desk or your bedside table? Or, if you prefer to take it on: can Poetry Save The World?